If you were stuck on a desert island and you could only have one little restaurant on that island, (which sounds like a pretty sweet little desert island), what would be the one cuisine it would serve? For me, I think that answer would have to be Thai. I have an obsession with rice noodles, green mango salad makes me weak in the knees, and my favourite condiment is soy sauce. Not to mention I think this whole meal and palm tree deal would go quite well with a Margarita and the Bob Marley Legend album that would accompany me on my desert island…. Ok, so I threw in some other cultures there, but to me that would be a pretty sweet little island. If you visit an island like this, please bring me with you! And now I look outside my window and frown at the 12 degree misty rainy day. Here’s hoping summer will get here soon! 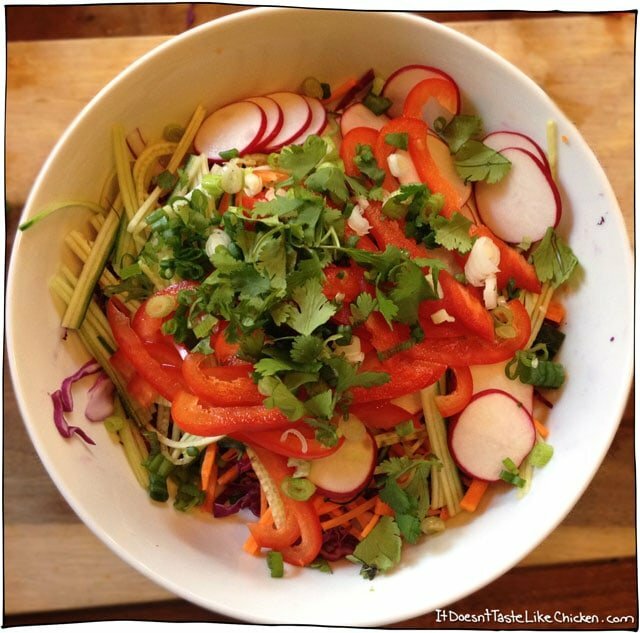 In the meantime, some fresh, healthy, Thai-inspired salad has been bringing out the sunshine in my life. This recipe is a little fussy. I admit it. Loud and clear. Did you hear me? This recipe is a little fussy. I am not a fan of making a fuss in the kitchen, but sometimes, it is just worth it. It really is, and when it’s really worth it, I promise, I won’t lead you astray. 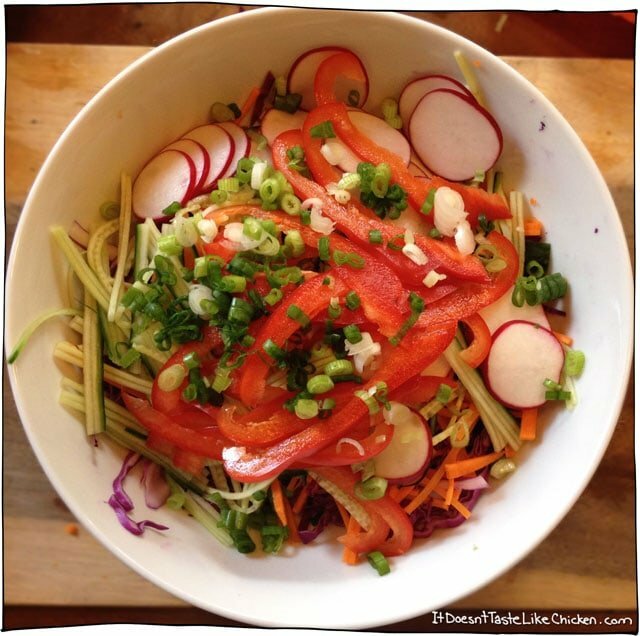 I have been eating this salad every single day since I first came up with it. That’s five days in a row now, and I see no point in breaking this pattern. It’s my new addiction, and really, if you are going to get addicted to something, I highly recommend salad. 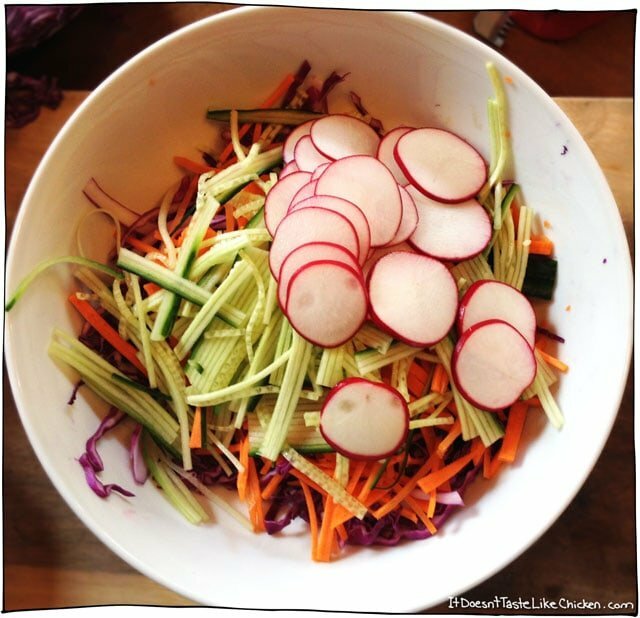 There is a lot of chopping in this salad. That’s really the whole fussy part, just a lot of chopping. So if you have a mandoline, you should use it. I’m not talking about serenading me with a little musical string instrument while I chop. There is a big difference between a mandolin, and a mandoline. Note the “e”. If you don’t already know, a mandoline is a slicer used for finely, evenly, and quickly slicing anything to your heart’s content. Including your fingers. So be careful and use a hand guard! I have the Benriner Mandoline Slicer. Andrew bought it as a little gift for me one day, and while I thought that was nice, I basically put it in my cupboard and didn’t use it for a few months. Once I finally brought it out and dusted it off, it quickly became one of my favourite cooking tools. You can easily slice anything super thin, and it comes with different blades so you can also cut veggies into matchsticks. 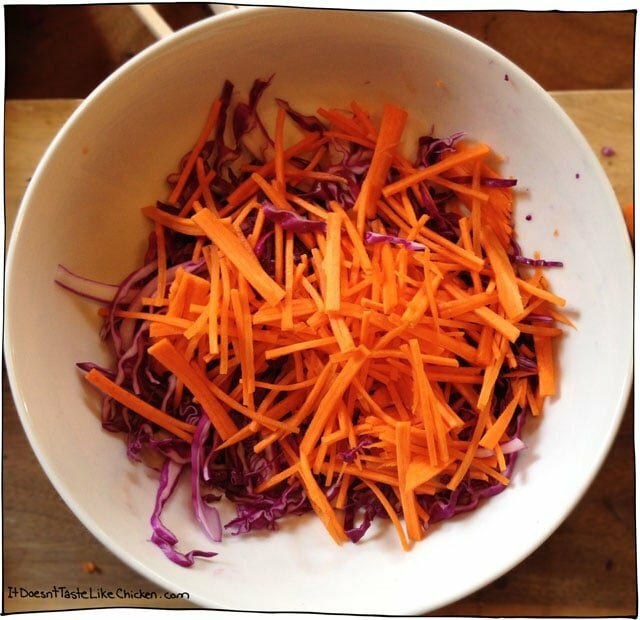 One of the beauties of this salad, is that it doesn’t really matter if you are missing an ingredient or two. It’s not the end of the world if you are out of cucumber, or perhaps short on radishes, you’re not a fan of tofu, or just feel like skipping it. 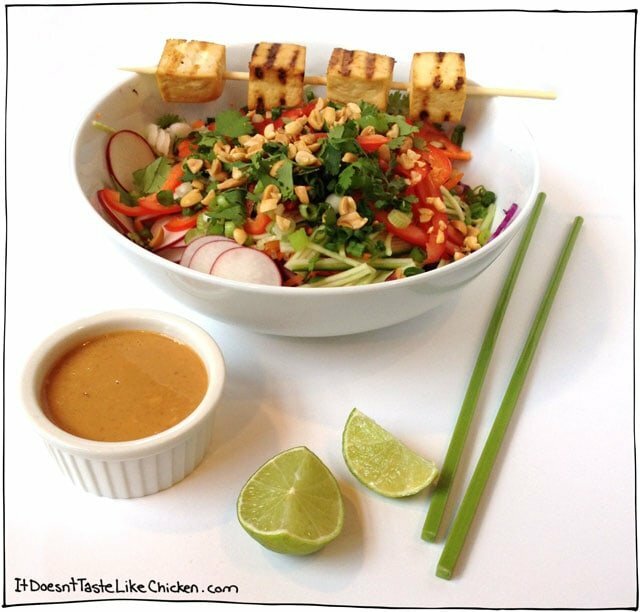 As long as you have most of these ingredients, and are able to top it all off with the peanut sauce, you’re all set. So put on your desert island playlist, and start the chopping! First start by rinsing, pressing, and then marinating the tofu with the soy sauce. 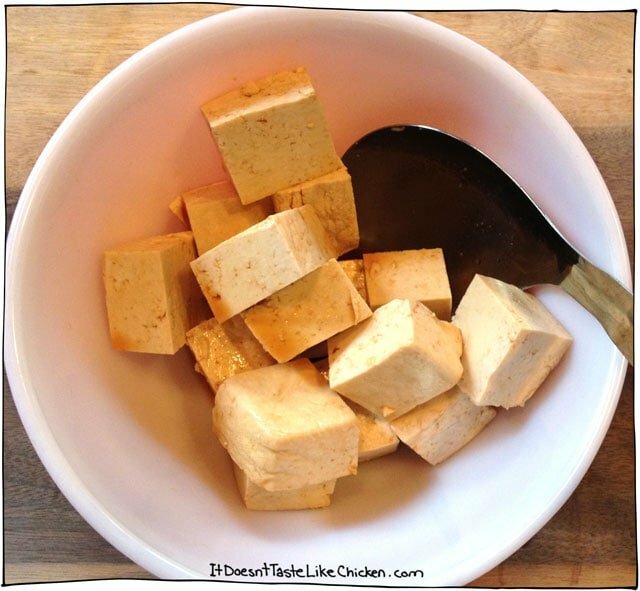 I like to cut up the whole block into large-ish pieces getting about 16 pieces out of a block of tofu. Marinate 4 piece of tofu in 2 teaspoons of soy sauce, or marinate all 16 pieces in 3 tablespoons of tofu, and save the rest for later. Let the tofu marinate for 15 minutes or longer. Grill the tofu. I do this in a grill pan, but you could do it on a BBQ, or if you don’t have access to either, heat a bit of oil in a frying pan and fry for a couple minutes on each side, until golden and crispy. This is my enormous salad bowl. This is what I consider one serving of salad, but I realize not everyone likes to eat a trough of salad like I do, so to warn you, this makes one monstrous salad. I love it. No dainty little side salads for me. I just put my mandoline right on top and start slicing away. 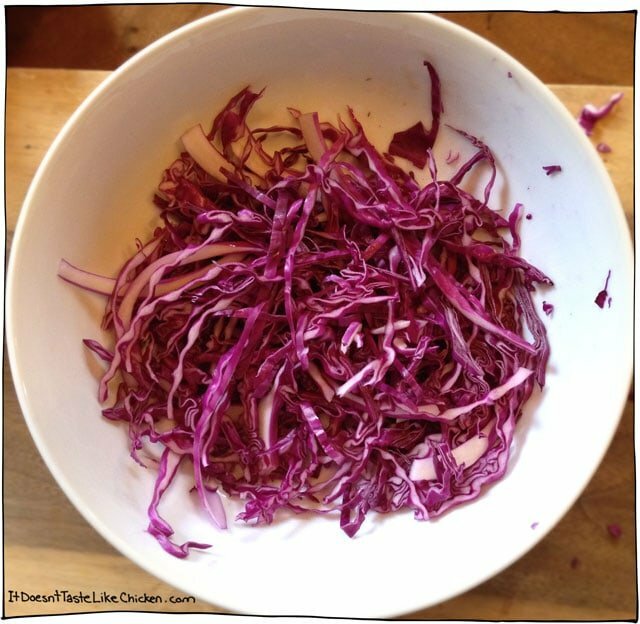 First the cabbage. Next carrots. I used the matchstick blade here, but you could also slice them in rounds. Then green onions. These I chop these with a knife as I find it’s easier. Then I chop some cilantro. And some peanuts. Excited yet? 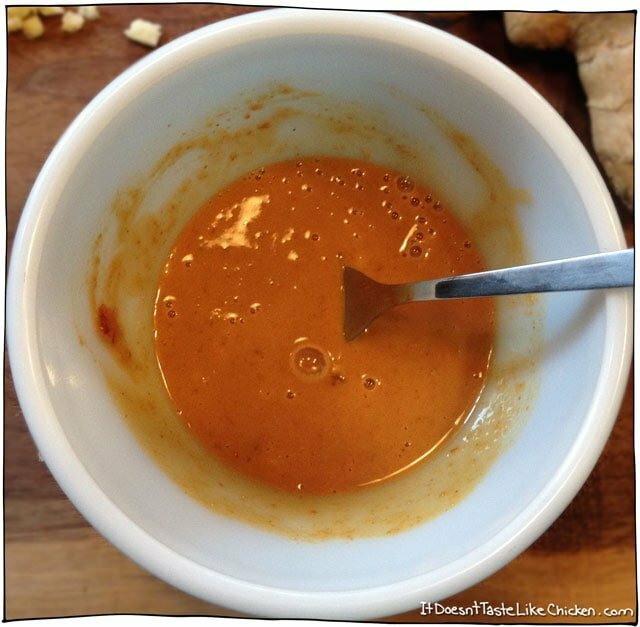 Then mix all your peanut sauce ingredients together, except for the lime wedge. 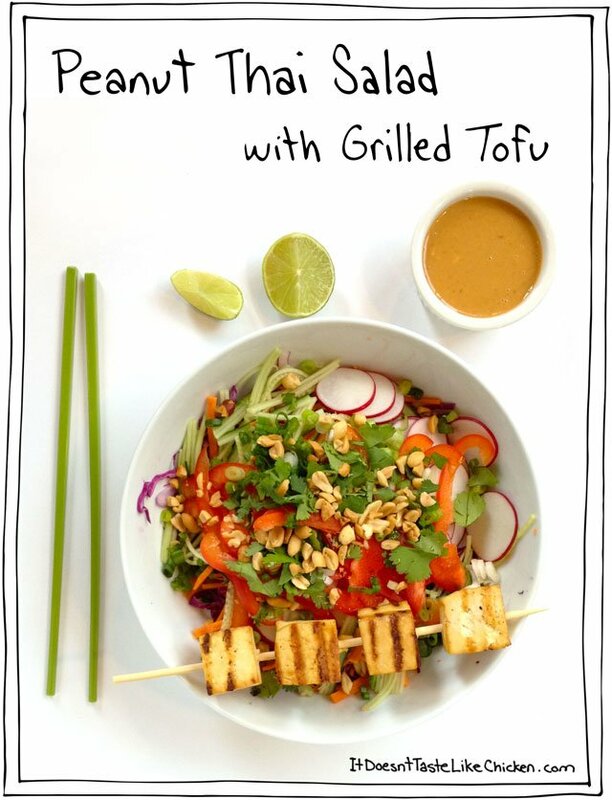 Place your tofu on top. 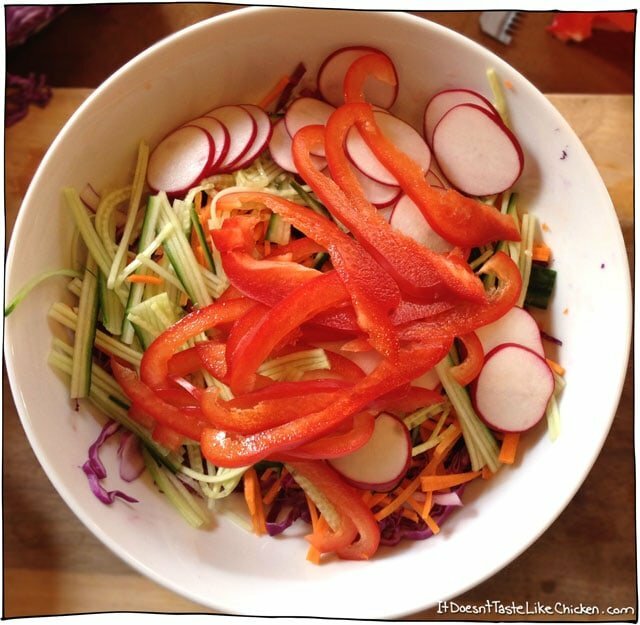 Serve the dressing on the side with a squeeze of lime. Admire all of your chopping glory, and then don’t be surprised when you don’t want to share a single bite of your enormous salad. Previous Post: « The World’s Easiest 5 Minute Pizza Sauce! Hi Sam. Just ordered your book. Have one question…..why do the r ec ipes have such high fat content including high saturated fat? This concerns me. Also, high sodium. Can we cut the saturated fat somehow? When I read the recipes they look so healthy, but saturated fat is not good. Love your blog. It’s my favorite go to for vegan recipes. You always make me smile. Hi Deb, happy I make you smile. I don’t have any nutrition info in my book for the recipes, so I just want to make sure you are thinking of the correct book? If so I would really have to go recipe by recipe to reduce the sodium and fat. I wanted a big salad to work off of for the whole week, so I chopped a ton of all the veggies and tossed them together. They held up beautifully! (I stored them in my FridgeSmart Tupperware, which may have had something to do with it) Either way….I made a batch of sauce and kept it separate until ready to serve. My hubby and I ate off of it for days and it was delicious each time. Thanks for sharing this! Kudos! Thanks so much for adding the nutritional info for this recipe. You ought to write a cookbook. Your recipes look scrumptious. Can’t wait to try them all. This is the first of your recipes I have tried and you weren’t lying – it was a lot of “fuss” but you also weren’t lying about how fabulous this is. It was so worth it! 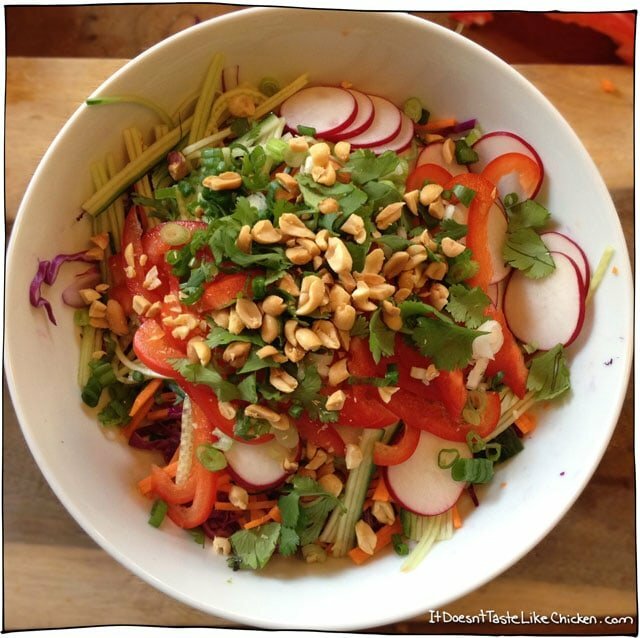 I couldn’t stop eating it and have enough peanut sauce left over for another salad tomorrow. I cut down the time on the tofu a bit by crisping up some pre-marinated and pre-baked tofu, used ginger in a tube, and pre-chopped garlic. Am sure that was cheating but it still tasted absolutely divine. 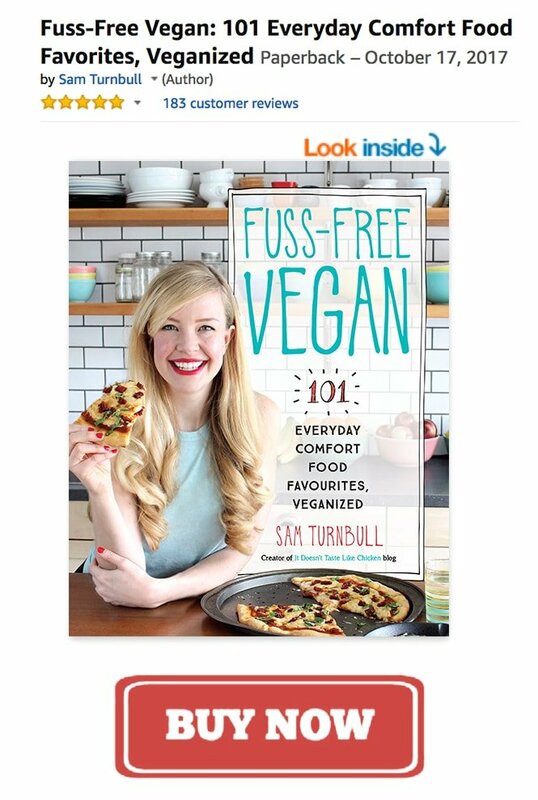 I’ve only been vegan for a month – still feeling my way – and very excited to try more of your recipes. Thanks so much. PS – Would love to have the nutritional info on this one if possible. This turned out amazing! I wish I could post a pic for you to see. Thanks so much! Oh yay!! I am so glad you loved it. You can share a pic with me on Facebook, Instagram, or Twitter. I would love to see! I LOVE peanut sauce! How can you not love peanut sauce. I hope you’re girlfriend enjoys it. (I’m sure she will, because, peanut sauce). I’m guessing you grate the ginger and mince the garlic when making the peanut sauce? Thanks for the idea of grilling the tofu. I am trying to stay away from as much added oil as possible in my diet and been trying to figure out a way to incorporate recipes which show to fry tofu by some other means. Not sure why I had not thought about grilling. Sounds like the perfect way to adopt to other recipes. Oh yes, silly me, grate or mince the garlic and ginger. Thanks for pointing that out Paul! 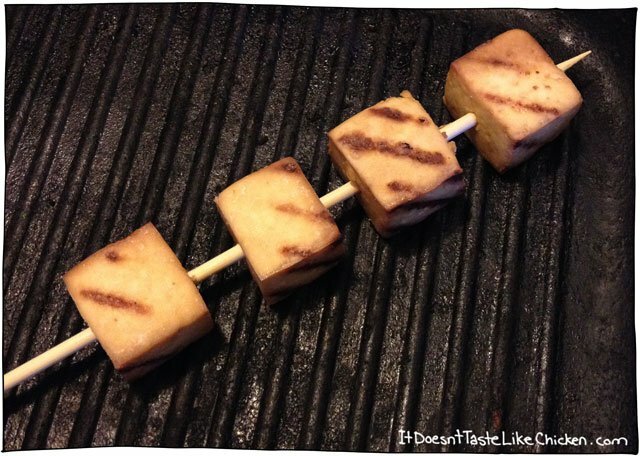 Grilling tofu is great! You can marinate it in any number of different sauces, and baste it as it grills as well. If you are doing it on a BBQ it will pick up a but of smokiness too. Yum! Peanut sauce is one of the best things ever. It is good on almost anything! Haha! That’s so true Mila!!! I loooove peanut sauce!